Looking for Phuket island hopping destinations? Here are the best islands near Phuket! There are hundreds of gorgeous islands near Phuket, and it would take forever to visit all of them. It is not easy to decide which islands to include in your island hopping journey from Phuket. But here are some recommendations for the best islands near Phuket that all type of travelers has loved the most. Since it was featured in the James Bond movie in 1974, the James Bond Island has been a must-visit place for tourists. Phang Nga Bay, where the James Bond Island is located, offers a jaw-dropping seascape. It’s a great photogenic spot and the reason why it was selected for the movie. It’s always fun to see the real place from a movie, even the old one! In Phang Nga Bay, there are many small islands besides James Bond Island. Joining a tour with speedboat is the easiest way to immerse yourself in the beauty of Phang Nga Bay. During the tour, you will visit 3-4 islands in Phang Nga Bay, exploring the caves and canoeing. You will have some time to swim and chill by the beach also. It’s a nice day trip filled with various fun activities so make sure you try all the activities on the tour. If you want to explore Phang Nga Bay with a luxurious sailing ship instead of a speedboat, you should check out this day tour. Phi Phi Islands are some of the most visited islands from Phuket or Krabi. They became popular after Leonardo DiCaprio’s movie “The Beach” in 2000. Since they are some of the most popular destinations from Phuket, there are many day trips you can join for the Phi Phi Islands. If you want to book a day tour to the Phi Phi Islands at a reasonable rate, click here. There are 2 main islands in Phi Phi, one is Phi Phi Don where the main town is, and the other is Phi Phi Leh, spot tourists don’t miss visiting. Phi Phi Don is the main town with many shops and restaurants. It is crowded with many travelers and an energetic vibe that offers a lot to do. Phi Phi Leh is famous for its must-visit spot for any visitors, Maya Bay. Maya Bay was made famous after it was used as the setting in ‘The Beach’ starring Leonardo DiCaprio. Its captivating scenery, clear waters and colorful coral reef system is certainly a sight to see! You also have the option to go to two islands! if you want to go to James Bond Island & Phi Phi Islands in 1 tour, check the tour below. *Note: Previously, Maya Bay was closed from June ~ September, in efforts to salvage the area’s coral reefs, which have taken a battering from warmer water temperatures and constant flow of tourists leaving their rubbish behind. But we’ve just received news that Thai authorities have closed down Maya Bay indefinitely, prohibiting any visitors to enter the bay itself until further notice. But don’t despair, although you won’t be able to enter the bay itself, the boats will be an able anchor down at the at the entrance of the bay, so you can admire the bay from afar. You will also be allowed to take pictures and spend some time swimming and snorkeling out of the boundaries of the bay. Instead, we highly recommend visiting the beautiful Khai Island where you can snorkel in the coral reefs and fish. Good news is that you can get a huge discount of 66% for Phi Phi Island + Khai Island Tour while it lasts. The discounted price will only be from June to October! This is your only chance! The Similan Islands are the hidden gems of the Andaman Sea. They offer some of the best diving experiences in Thailand. The islands are so strikingly beautiful; you don’t even need to be a good photographer to take some amazing photos. The best way to enjoy the Similan islands trip is to book a tour that takes you around for some snorkeling spots. Similan Islands consist of 9 islands, and by joining a tour, you will get to see the most popular spots in the Similan Islands. Water near the Similan Islands is warm and incredibly clear. If you’re looking to dive into Thailand, it’s certainly the spot to put on the top of your bucket list. Note that the Similan Islands are only open from mid-October to mid-May. So, don’t miss a chance to visit them when they’re open to the public! The time varies each year so always check before planning a trip out there. If you want to experience a real paradise, the Surin Islands is the perfect place for you! While most of Thailand’s islands and beaches are becoming very popular and busy with so many tourists, Surin Islands remain less busy and well-protected by the government where you can surrender yourself to the clear water and quiet beach. The water is crystal clear and perfect for snorkeling. There is no food vendor or loud tourists ruining the vibe of Surin islands. Just string up your hammock and relax with a good book or dive into the clear water for some quality snorkeling. Since it’s further to reach from Phuket than the other islands mentioned above, consider taking a premium tour. It’s definitely a longer speedboat ride so having a comfortable boat ride is important. A premium tour to Surin Islands is an all-inclusive tour with premium boat rides, breakfast, lunch, snorkeling gear, and even beach towels. Like the Similan Islands, the Surin Islands are only open from mid-October to mid-May. So, don’t miss your chance to visit there when they’re open to the public! The time varies each year so always check before planning a day trip out there. You don’t have to go too far from Phuket to experience all the exciting water activities. Coral Island is only 3km away from Phuket. The island is named Coral Island because it is surrounded by multicolored coral reefs. The island has two main beaches, Long Beach and Banana Beach. Both beaches feature long stretches of white sand and crystal clear water with plentiful tropical fishes. There are plenty of water activities such as snorkeling, scuba diving, banana boat rides, and sea-walking which are available on the island. It is one of the most popular islands near Phuket for a day trip. Snorkeling gear and beach chairs can be rented but if you join a tour it comes for free. There is a range of eateries so you will have no problem finding a restaurant and toilet facilities. Racha Yai is one of the nicest islands to simply get away from everything and relax. Definitely fewer boats and tourists visit this island and jet ski & parasailing are officially banned. The water around Racha Yai is crystal clear and has turquoise color. Swimming near the beaches and in the bays is a great way to spend the day. Or even try going a bit more fancy with a catamaran, which takes you to Racha Noi Island as well. Racha Noi is a twin-island with Racha Yai. It is an uninhabited island so you will have such a relaxing time there. This tiny island of Phuket’s southeast coast is well-known for its perfect natural environment, including fine white beaches and crystal clear waters; ideal for swimming, diving, or fishing. Mai Thon Island is popular for a honeymoon destination. Try going on a luxurious yacht catamaran tour and fishing on the yacht near the island. Simply join a tour if you wish to go to Mai Thon Island. It is the best way to travel this secluded island with no hassle. Click on each island for more info! Or how about looking through Trazy’s brand new Thai Island Paradise page? This is going to help you learn a little bit about the islands around Thailand, including those mentioned above and eventually help you decide where you want to go for an island getaway! You can search for the island tours from three different areas; Phuket/ Krabi, Pattaya, and Koh Samui/ Koh Phangan. Not only can you search for island tours in each area, but you can also search for tours with discounts you can’t refuse! Personalize your trip by selecting appropriate options such as trip duration, departure location, boat type and so on to find the perfect island tour just for you! 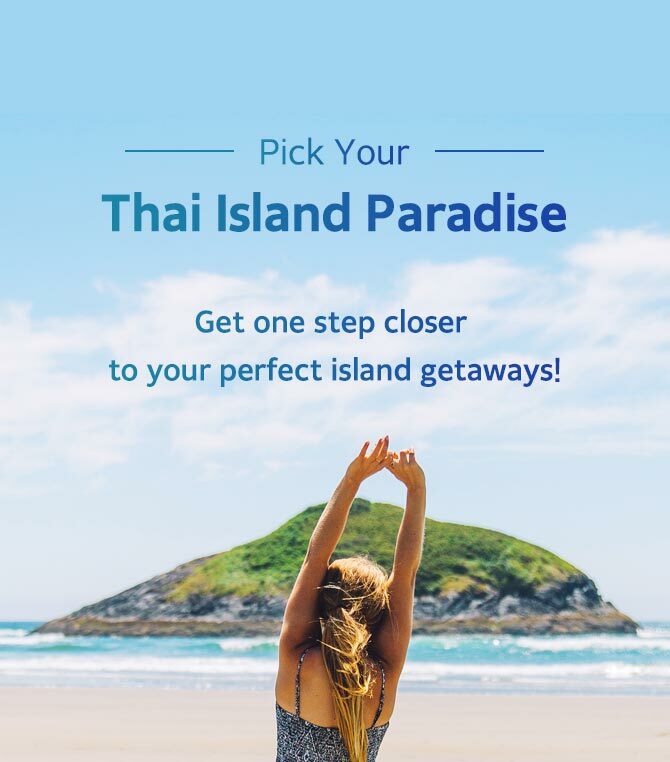 Click here to choose your Thai Island Paradise now! Phi Phi Island is such a great day trip from Phuket or Krabi! The southern islands of Thailand are one of the most incredibly beautiful places in the world. There’s not much better than island-hopping around!